The purpose of the project is to help integrate the individual programming skills learned this semester to solve engineering problems. Because these projects are meant to help develop problem-solving skills, the tasks are more involved than typical homework problems. 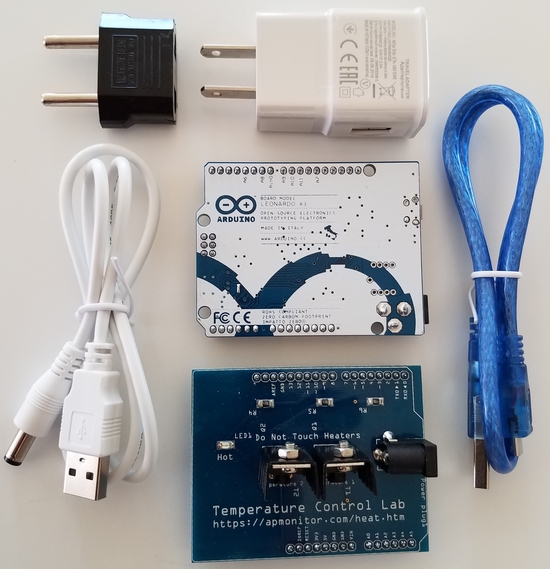 The project is a review of all course material but with real data from temperature sensors. 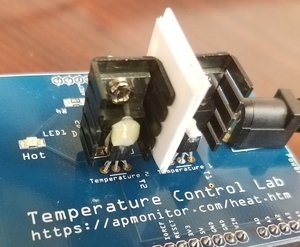 The temperatures are adjusted with heaters that are adjusted with an Arduino micro-controller. This lab hardware is also used in the Process Dynamics and Control Course and the Dynamic Optimization Course but for automatic control. The final project is divided into multiple parts that are turned in apart from the regularly scheduled homework and are due every week on Friday. 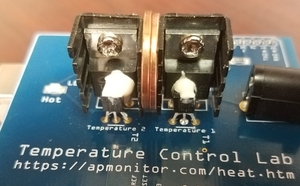 Metal coins, plastic, and cardboard are inserted in between the two heaters so that there is a conduction path for heat between the two sensors. 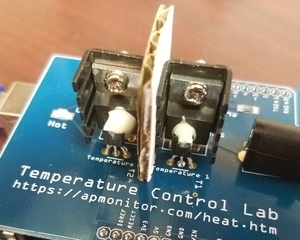 The temperature difference and temperature levels are affected by the ability of the material to conduct heat from heater 1 and temperature sensor `(T_1)` to the other temperature sensor `(T_2)`. You may not always know how to solve the problems initially or how to construct the algorithms. You may not know the function that you need or the name of the property associated with an object. This is by design. You are to search out the information that you might need using help resources, online resources, textbooks, etc. You will be graded not only on the ability of the program to give the correct output, but also on good programming practices such as ease of use, code readability and simplicity, modular programming, and adequate, useful comments. Just remember that comments, indentation, and modular programming can really help you and others when reviewing your code.